World War I Bridges - WW1 Centenary from the river Piave: First World War one day itineraries through Italy. Suggestion no. 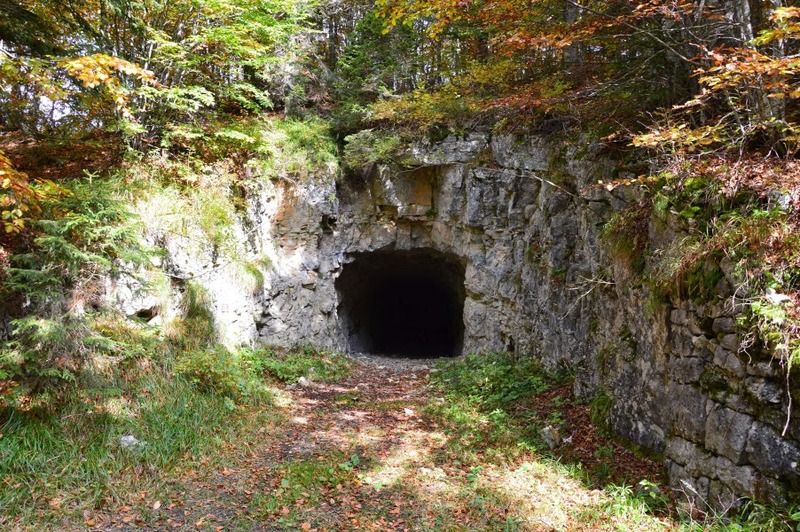 17: Monte Totoga and its "Stoli"
First World War one day itineraries through Italy. Suggestion no. 17: Monte Totoga and its "Stoli"
The Italian and Austro-Hungarian front line is drawing more and more interest, not only among historians of the First World War, but also among simple visitors and hikers. And yet, some of its sections still remain out of the usual circuits of mass tourism – luckily! – offering so the chance to visit environment in which nature, anthropomorphic interventions and historical memories coexist in a living symbiosis. This is the case of the Primiero and Vanoi Valleys, along which the former front line run (here an overview in Italian and German). As the Great War broke up, being the bulk of the Austrian Army engaged on others fronts and yet mistrusting the Italian ally, the Double Monarchy settled immediately at least a defensive line close to the Lagorai range, up to the Passo Rolle, so to use the natural bastion of mountains between the Fiemme Valley and the Primiero. Especially during the battles in the summer and autumn 1916 the fortifications built on Monte Cauriol, Cima Cece and Colbricon were crucial to stop the adversary and are still today visible. On the other side, the Italian Army, although much more numerous, was forced to build up its assault and defensive lines in a more difficult geographical environment, lacking in natural and solid bastions: a line of advanced posts was formed on Monte Cauriol and on the eastern summit of Monte Colbricon only during the last battles in the 1917; different fortifications, trenches laid instead on the bottom of the Vanoi Valley (Refavaie – Caoria) and then climbed up the opposite range of Mezzogiorno and Valsorda Peaks, reaching then the Calaita pass and the Pale di San Martino. However, the most imposing Italian defensive line was created a little bit behind of this front and included above all the fortifications on Monte Totoga that we suggest to visit with a simple – suitable for all hikers - and short – altogether 4 hours – itinerary. Starting point is the small hamlet Gobbera, on the homonymous pass. If you come from Imer you find on your right a small car park, just before entering the hamlet. Park the car there and have a look to the near informative totems. Then walk on and if you need to buy something to eat or drink do it in the local shop in front of the church, since there’s no refreshment on the way. However the itinerary is not so overwhelming, so, if you have water with you, you can also take immediately the path n. 345 just behind the church, walk among the few houses and after running along a small pine grove, take the mule track, which still corresponds to trail n.345. The path is really easy, even if it becomes more and more narrow and stony. During the summer it may be very hot, that’s way we suggest to undertake this itinerary in spring or autumn (in this last case, pay attention to the leaves, they’re very slippery especially on the way down), but the panorama on the Pale di San Martino is really beautiful. At a certain point you find a crossroads: if you walk on the “normal” path, slightly on the left, the excursion would be easier but also longer, that’s why we suggest to take first the small trail on your right, which steeply climbs the slope, reaches the path n.345 again and leads you in short to a small unattended refuge San Gualberto, where you can rest and eat, but only if you’ve taken something with you. Otherwise walk few steps on and visit the near Italian fortifications, whose entrance is on your right. The so called Stoli are wide galleries dug on the limestone of Monte Totoga, as usual with huge openings, meant to enable the positioning of heavy artillery. The galleries are two, placed on different levels (one above the other) to strengthen the fire attacks against the Austrian line, and dominate the Val Vanoi. You can walk in the humid corridors and visit the dark shelters (take a torch with you!) 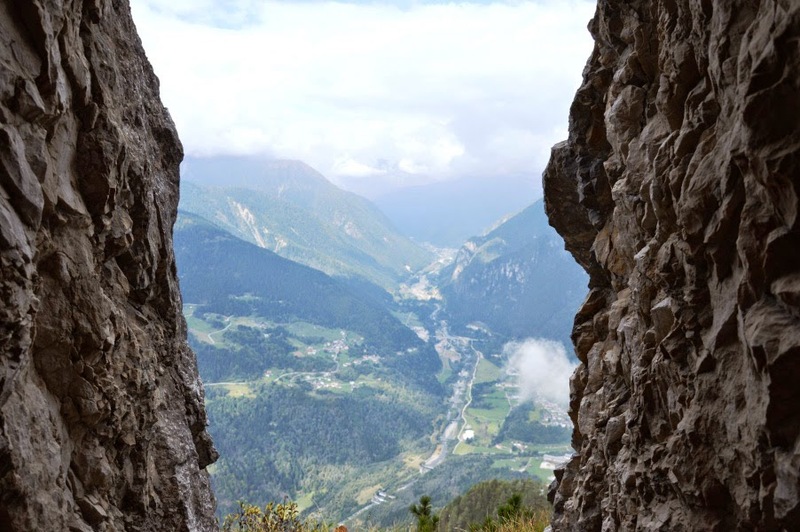 and above all look at the valley below and the small village of Canal San Bovo. After visiting the Stoli, take a short walk on the top of Monte Totoga: near the entrance of the upper gallery, on the right, a really tiny and almost invisible red mark signals the path which runs among the wood and is sometimes very difficult to follow (so, pay attention especially to the red marks on the bark of the trees!). From the summit you can contemplate the Lagorai range and especially the couple Cima d’Asta – Cauriol, looking at each other. The way back follows the ascending path, but you can eventually avoid the steep trail, remain on the path n. 345, walk through the Prà di Totoga – a pasture – and then reach again the Gobbera pass. You can eat and rest here, in the small and nice restaurant of the hamlet, or drive to Canal San Bovo and stop for a rest along the road.